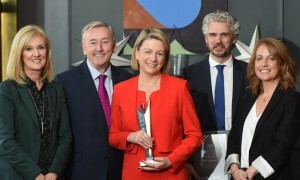 Irish woman, Fiona Dawson, Global President of Mars Foods, Drinks and Multisales, has been named as Ireland’s Ultimate Marketer, at an event celebrating 25 years of the Marketer of the Year™ award, which is organised by Marketing.ie and sponsored since 2006 by Alternatives. A notable series of career firsts include becoming Mars’ first ever female General Manager. As President, Mars Chocolate UK and Global Retail she demonstrated her commitment to cause related marketing, and created brand partnerships such as Maltesers and Comic Relief, which saw over £2.5million donated to projects in the UK and Africa; Galaxy and Quick Reads, working in partnership to tackle adult literacy projects; and the FA Mars JUST PLAY initiative which helped to get adults back playing football at a grassroots level. She was also the first woman to win the prestigious Grocer Cup which is awarded to business leaders who have inspired their teams to achieve exceptional results. She was also the winner of multiple marketing awards. Marketer of the Year™ is organised by Marketing.ie magazine in association with Alternatives, the marketing talent solutions house. Marketer of the Year is registered in the Register of Trade Marks in the name of Marketing.ie under the Trade Marks Act 1996. Any use of Marketer of the Year™ in the Republic is strictly the preserve of Marketing.ie.